"phi Phi Islands" Superb Coconut Paradise Villa !! "PHI PHI ISLANDS" is a Fabulous 4 Bedroom Villa Comprising "PHI PHI DON" a Beautiful 3 Bedroom Villa and "PHI PHI LEY" a Self Contained 1 Bedroom Villa, Sleeping 8/10 People all with Private Pool and Private Garden set in an Attractive Courtyard and sitting in the Lush Tropical Grounds of "COCONUT PARADISE". "PHI PHI DON" Can also be Booked without "PHI PHI LEY" as a Beautiful Three Bedroom Private Pool Villa Sleeping 6 People. "PHI PHI DON" Accomodation Comprises a Master Bedroom with Kingsize Bed and a Beautiful Fully Fitted En-suite Bathroom with Sunken Bath and Shower. There are two Twin Bedrooms sharing a Light and Airy Fully Fitted Shower Room. The Living Area, Kitchen, Dining Terrace and one Twin Bedroom all overlook The Pool and Coutyard. The Villa is Fully Fitted with High Quality New Furniture, It has a Spacious Open Plan Living Area Adjoining the Kitchen all Opening onto a Large Attractive Terrace which is Perfect for Al-Fresco Dining Overlooking the Pool. The Living Area has a Large Comfortable Sofa, Flat Screen TV with 50 Channels on Cable and a CD/DVD player, Mobile Phone with Local Sim Card and Wi-fI Internet. The Fully Fitted Kitchen Includes Oven, Hob with Extractor Hood, Microwave, Fridge / Freezer, Dishwasher and all Essential Equipment. The Adjoining Laundry Room includes a Washing Machine, Iron, Ironing Board and Safety Deposit Box. "PHI PHI LEY" has a Similar Fully Fitted Kitchen with Hob, Extractor, Microwave and Fridge / Freezer. It has an Open Plan Living Room / Kitchen. The Living Area has A Mobile Phone with Local Sim Card, TV with 50 Channels on Cable and a CD/DVD player and Wi-fI Internet. The Villa is Fully Fitted with High Quality New Furniture, The Bedroom has a Kingsize Bed and En-suite Shower Room. Both Villas have Ceiling Fans, Fly Screens and Full Air Conditioning Throughout. 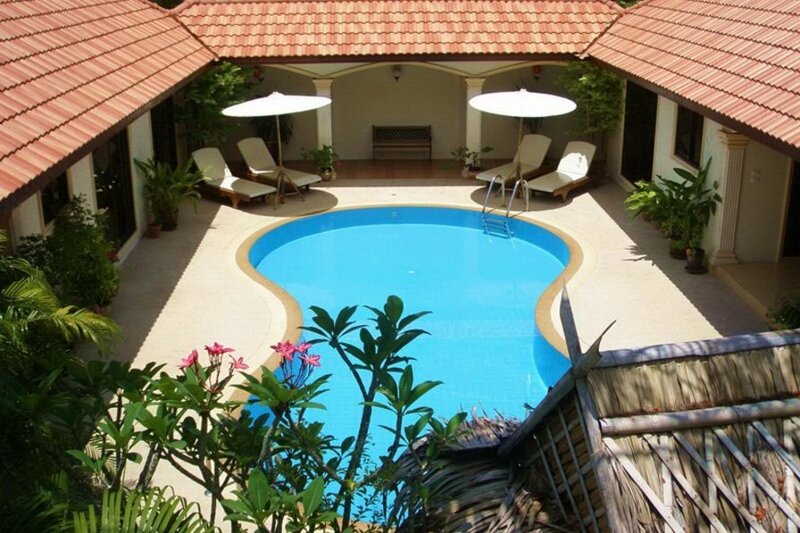 There is Thatched Sala and Comfortable Sun Loungers for Relaxing next to The Pool and also a Double Car port. When you Arrive, we offer to take you on a Short Complimentary Tour of our local area , showing you the Best Beaches, Bars, Restaurants, Shops etc. so you can enjoy every minute of your holiday right from the time you arrive. We Welcome you to experience First Hand, a Special Holiday at "COCONUT PARADISE".